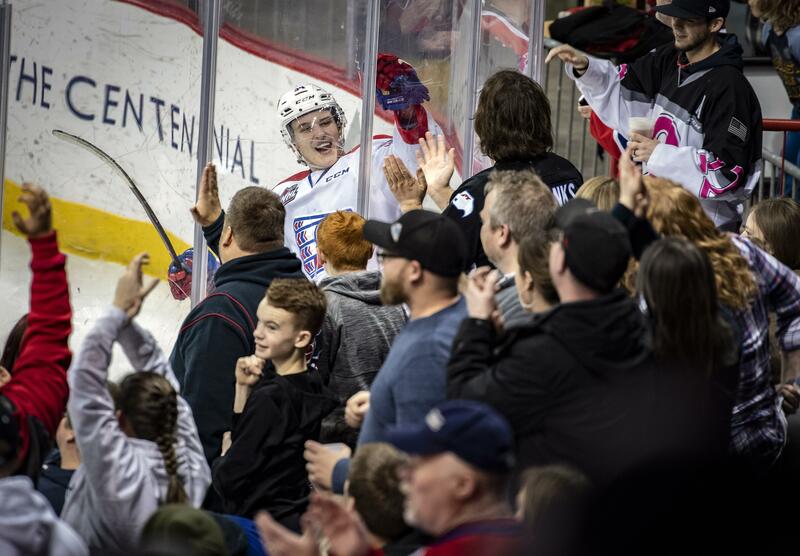 Beckman scored two goals to lead the Spokane Chiefs to a 4-0 win over the Kelowna Rockets Friday night at the Arena. Goaltender Reece Klassen stopped all 25 shots the Rockets put his way for his first shutout as a Chief. Riley Woods and Eli Zummack each had two assists. The Chiefs got another night of balanced scoring, with nine players recording points. The win, coupled with the Tri-City Americans’ loss in Victoria, moves the Chiefs four points ahead of their U.S. Division rival for third place in the division. There was nothing flashy about the win – just a solid effort throughout the night for a Chiefs team that has won two in a row following a five-game losing streak. “Our goalie made some saves for us when we needed him to, which was key. Overall, it was a pretty nice win,” Chiefs coach Dan Lambert said. The Chiefs outshot the Rockets 32-25 and Klassen made his saves look routine. It was evident his teammates wanted to protect the shutout as the game wore on. Beckman’s two goals give him 21 on the season. That’s good for second among rookies in the Western Hockey League. He might be a rookie, but Beckman has showed his scoring ability from the start of the season. The Chiefs elected to keep Beckman off the roster last year to get him more ice time as a 16-year-old. That move has paid off. “You need guys to step into the lineup and have better showings than you’re expecting, and it’s great for him to have that type of season,” Lambert said. After Jake McGrew opened the scoring at 8 minutes, 2 seconds of the first period, Beckman got on the board at 15:55 of the second when he skated in from the left side and sniped a shot past Kelowna goaltender and Bonners Ferry native James Porter. After Nolan Reid gave Spokane a 3-0 lead at 1:54 of the third, Beckman scored his second of the game after he sneaked a wraparound past Kelowna goaltender Roman Basran, who relieved an injured Porter in the second period. Officials briefly reviewed the goal, but replay showed the puck inched across the goal line. Klassen’s performance was especially important heading into the third period when the Chiefs held a two-goal lead. “If he makes a mistake, they’re right back in it,” Lambert said. The Chiefs hopped on a bus after the win and play in Portland Saturday against the Winterhawks. Published: Feb. 1, 2019, 10:19 p.m. Updated: Feb. 1, 2019, 10:57 p.m.